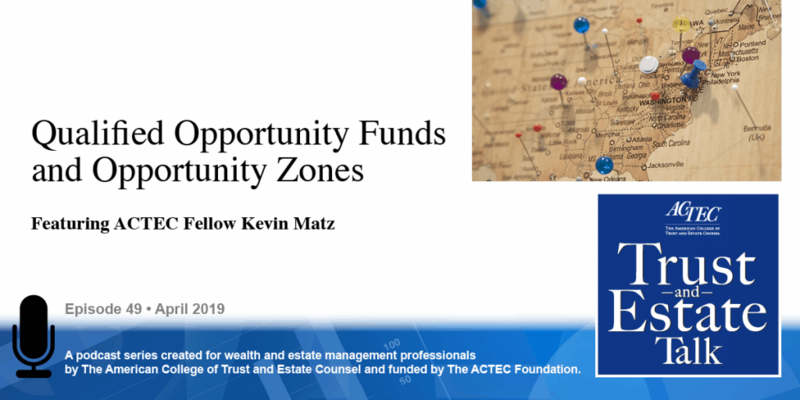 “Qualified Opportunity Funds and Opportunity Zones,” that’s the subject of today’s ACTEC Trust and Estate Talk. This is Susan Snyder, ACTEC Fellow from Chicago. 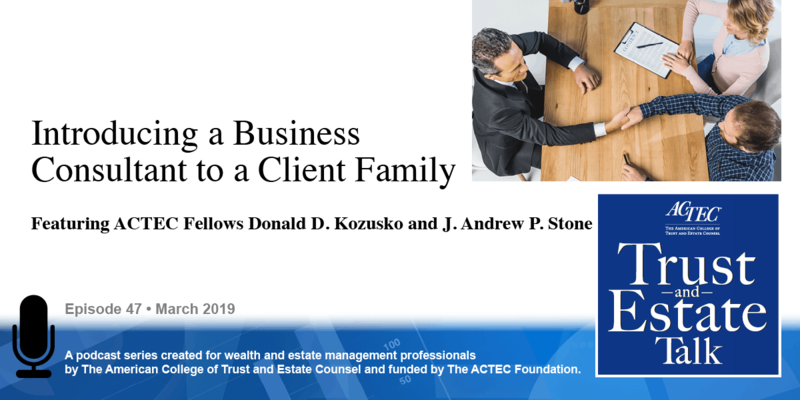 To discuss this interesting topic you will be hearing today from Kevin Matz, ACTEC Fellow from New York City. Welcome, Kevin. Thank you, I appreciate it. So, Qualified Opportunity Funds and Opportunity Zones, now very importantly today is March 23, 2019. I say that because we know there is going to be a second tranche of proposed regulations coming out literally any day and it could well be that at the time you hear this recording it needs to be updated. But that being said, here we are March 23, Now this is a very exciting area of the law, this is stuck into basically the 2017 Tax Reform Act. The one bipartisan provision that was included in the 2017 Tax Reform Act as it’s been floated around in several bills and then got included in this provision here. The whole purpose of it is to promote substantial, very significant investment in so-called economically distressed communities, referred to as Opportunity Zones. And this- going back to a think tank about ten years or so ago- it was decided that we’re going to use the tax code as a mechanism for this and what was decided upon as the funding mechanism for capital gains. So, you have a capital gain, within 180 days if you happen to invest it in a Qualified Opportunity Fund (QOF) you can achieve certain tax benefits. What are those tax benefits? There are three. So, number one is the opportunity to defer your gains, and again we’re talking about capital gains, not ordinary income, but capital gains and that you have to factor in recapture. So if you take your gain, within 180 days and you may say, “Well, what if I don’t know about the gain because it is in a partnership or S-corporation, trust, and estate?” We’ll get to that. There are proposed regulations that address this to some extent, but if you take your gains within 180 days invested in this vehicle, this new creature statue called the Qualified Opportunity Fund, you could potentially defer your gain, defer recognition of gain all the way down the road without any interest charged whatsoever to December 31, 2026. Again, no interest charged whatsoever. If you happen to dispose of your interest at an earlier date, well, it would be recognition then. You could perhaps have losses, dispose of your interest at that point in time, pay no tax whatsoever, but a wonderful deferral opportunity. Secondly, if you happen to hold the interest in the Qualified Opportunity Fund for certain periods of time you can get basis step ups. You start out with zero basis- both the code and also the first tranche proposed regulations tell us- you can get basis step ups and potentially reduce the amount of gain that has to be recognized come the so-called judgement day, December 31, 2026, by as much as 15%. The way is works is that if you hold it for five years, you get a 10% basis step up, if you happen to hold the interest in the fund for another two years to get to seven years you can get another 5% above that, and therefore you could actually have up to 15% of the gain eliminated. Well the answer is you’re not necessarily too late. Are you within 180 days? He says, “Well, yes I am.” In that case come on in! You could possibly do this. Now you have to invest, you just can’t invest directly. You can set up your own Qualified Opportunity Fund and then do it, but you have to invest in a Qualified Opportunity Fund. And then the client says to you, “But I guess that’s like a 1031 Exchange, and I have to escrow funds, right? And I have to do not just the gain, but it’s the entire proceeds?” The answer to that is no, that’s not the case here. It’s just the increment, it’s just the gain whatever that fungible amount is, you don’t have to segregate it, you don’t have to escrow it, you just pluck that gain and put it in the fund within 180 days and you can do that. And they say, “Well that’s good, are there any other benefits?” In this example let’s just assume it’s a 20 million dollar value, I said 20 million because big numbers are easier to illustrate. If you happen to hold your interest in the fund for five years you start out with zero basis, but you then get a 10% basis step up, 10% of 20 million dollars gives you two million dollar basis. If you happen to hold it for seven years you get an additional 5% above that which means you have a 15% basis step up and that means 15% of 20 million dollars is three million dollars, you’ve just eliminated 15% of your gain. And then they say, “Okay, sign me up that sounds so great!” But it’s like hold on, hold on a second, there’s even more. What happens here?! If you happen to hold the interest in the fund for ten years, now understand I’m a tax, trusts, and estates lawyer, I’m not an investment advisor; it could go kerplunk, it could go down to nothing, you could lose your shirt on it, but if it happens to go up from, let’s say, 20 million to 50 million that additional 30 million dollar gain will not be taxed at all. Wow. Then the client says, “I’m ready to sign up but I forgot to tell you something. The gain wasn’t in December it was in February of last year. Which means it’s more than a year ago I’m more than 180 days past; I guess I’m out of luck.” The answer to that is the first tranche of proposed regulations say you still may be in luck. Because, unless an election was made otherwise, if you happen to hold it not directly but through a partnership, which would also include an LLC that taxed as a partnership, or an S-corporation, you’re an S-corporation shareholder. Or in the case of a trust or estate, you can basically say, unless there’s an election otherwise, you can use the last day of the taxable year. Which means even though the gain may have occurred more than a year ago because you’re deemed to have the gain occur- unless you elect otherwise, December 31- you’re still within play, you can do this. The answer is no. Because the first tranche of proposed regulations, which came in out in October said that all you have to do have the entity saying it’s a fund. 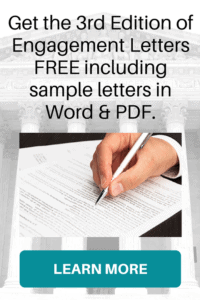 File this Form 8996, it’s on the IRS website with instructions for a two-page form, four pages of instructions, you attach it to the timely file return and say I am Qualified Opportunity Fund as of such-and-such a date. I meet this 90% of assets test going forward. IRS in second tranche will give further us guidance as to what will happen, consequences, if you consistently fail. But if you do that and it’s attached to the entity’s timely file return, voilà, you have a Qualified Opportunity Fund. They then say, “Ninety percent of assets, that is pretty hard to obtain.” Well, there are techniques under the statute, the first proposed regulations, that give you a lot of flexibility. If you happen to not have the direct investments to the Opportunity Zone property, by the way this has to be property acquired by purchase and it has to either be new property or a substantial improvement. Substantial improvement is defined by at least increasing the basis of the property by doubling it over the course of thirty months, it can’t be old property contributed, it has to be new, or substantial renovation effectively. But if you do that and you drop that in the Qualified Opportunity Fund has what’s known as, not direct zone property investment, but rather investment in a zone business, a Qualified Opportunity Zone business, which is either a zone corporation or partnership, the test gets watered down. The first tranche of proposed regulations say you only have to have for that particular zone business 70%. The explanation in the provision’s preamble say that 90% x 70% means 63% does it, but it goes even beyond that. If you happen to have a zone business, the statue of proposed regulations made clear that you can then use this working capital exception to possibly have 31 months to be able to deploy capital, so lots of flexibility. What are the key estate planning points- when we think estate planning, what do we have to consider? What if someone dies? What if the investor dies? 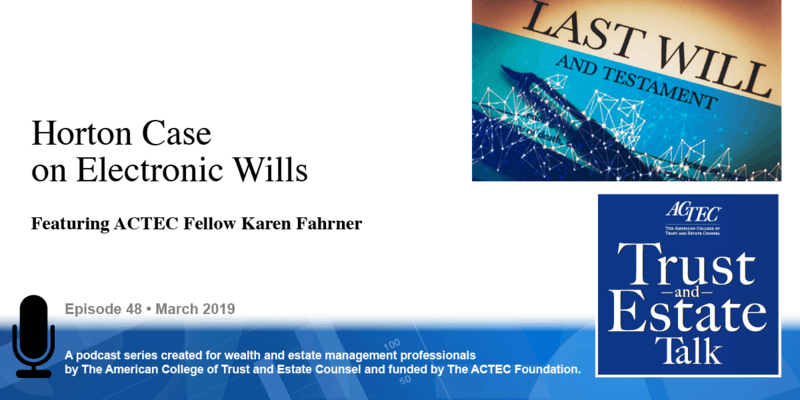 The statute addresses this, it says that if someone dies, then in Section 691, which is the income in respect to the decedent, we call it… we love our acronyms in trusts, estates, and tax law, we call it–we call it IRD, would apply, which basically says that you don’t get a step up in basis, death itself is not a taxable event in of itself, but the deferred gain is simply going to carry over to the successor in interest: be it the estate, it could be a beneficiary who receives a direct bequest, residuary beneficiary, or whatever subject to the rules that are set forth in the Section 691. Which means that when so called judgement day comes, December 31, 2026, unless there’s an earlier disposition, whoever is holding the hot potato of the Qualified Opportunity Fund interest will have to pay tax at that time. Now, if it so happens you have an uncle who says I’m going to give certain property, including this qualified Opportunity Zone interest, to my favorite nephew. And he gets that interest and it so turns out that’s all he gets, he doesn’t get a lot of cash. December 31, 2026, the nephew is going to be inheriting a very substantial tax liability and may not have the ability to pay. Presumably these funds are not going to be very liquid, we don’t know if a secondary market’s going to develop for it, what sort of redemption provisions will be provided, it’s going to be case by case in any event, so you have to think in terms of planning. Maybe life insurance in a reputable life insurance trust, perhaps having a reputable life insurance trust coupled with a Qualified Opportunity Fund being held by it so this way you plan for it because otherwise there could be mismatch of beneficiaries. So those are some of the concerns, just very quickly some others. What if you gift the interest? You want to make sure there is going to be a tacking of interest and by the way ACTEC, American College of Trust and Estate Counsel, in our comment letter addresses this point, addresses possible solutions to the income in respect to the decedent. Very briefly, why impose this hardship on the beneficiary? Why not give them a longer period until they ultimately dispose of their interest? There should be tacking involved in the case of gifts, there should be tacking involved in the case of sales to grantor trusts that are not recognized as taxable events (see Revenue Ruling 85-13. Why not have tacking? The last point is I said that you have 180 days, and you get 180 days in many cases deemed from the end of the taxable year which is great, but what happens when there’s an S-corporation, partnership, trust or estate? You get this information with your capital gains are on your K-1. And if the return goes on extension you may not get the K-1 until you’re more than 180 days into the next taxable year. Which means that despite the best of intentions to take this gain and plow it in because you didn’t know the amount or didn’t feel comfortable, I guess we could always guess, and to the extent that you’re off you perhaps refine from there, different topic for different day. But, how do we proceed there? Now ACTEC in its comment letter what we did was: we said that’s a problem. Because the purpose of the statue is to take investor gains- capital gains- and to further the policies of the statue have it invested in these Qualified Opportunity Funds so that the funds can then be invested in the economically distressed communities, i.e. the Opportunity Zones. You frustrate that if you have 180 day cut off and the taxpayer doesn’t get the K-1 until more than 180 days. So what we’ve proposed in our ACTEC comment letter is that there be a second outside limitation that could apply if later than 180 days after the end of the taxable year, 180 days after the timely filing, including extensions of the tax return that gave rise to the K-1, be it a partnership tax return, an S-corporation, or for a trust or estate. So that’s Qualified Opportunity Funds and again where we stand on March 23, 2019. Thanks, thanks so much Kevin for speaking about this new tax technique.